Arkansas is a southern state in the southern United States. The 2000 census was 2,673,400. Its U.S. postal abbreviation is AR. It was admitted as a slave state in 1836. USS Arkansas was named in honor of this state. State nickname "The Natural State"
The early French explorers of the state gave it its name, which is probably a phonetic spelling for the French word for "downriver" people, a reference to the Quapaw people and the river along which they settled. Other Native American nations living in present-day Arkansas were Caddo and Osage. 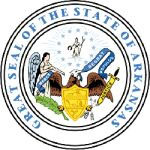 On June 15, 1836, Arkansas became the 25th state of the United States. Arkansas seceded from the Union on May 6, 1861 during the American Civil War. Under the Military Reconstruction Act, Congress, by June 1868, had readmitted Arkansas, as well as North Carolina, South Carolina, Louisiana, Georgia, Alabama and Florida. The current governor of Arkansas is Mike Huckabee(2004), a Republican. Huckabee, who had been elected lieutenant governor in a 1993 special election, ascended to the governor's office when Governor Jim Guy Tucker, a Democrat, was convicted of felony mail fraud as part of the Whitewater Scandal. This led to a state "Constitutional crisis" when Tucker refused to give up the governor's office for a short period of time, because the Arkansas Constitution does not allow a convicted felon to be governor of the state. Tucker had been lieutenant governor under Bill Clinton and had become governor as a result of Clinton's election to the presidency. The capital of Arkansas is Little Rock. Arkansas is the only state in the US where diamonds are found naturally. The eastern Arkansas border is the Mississippi River. 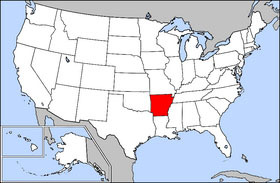 Arkansas shares its southern border with Louisiana, its northern border with Missouri, its eastern border with Tennessee and Mississippi, and its western border with Texas and Oklahoma. Arkansas is a beautiful land of mountains and valleys, thick forests and fertile plains. The Ozark and Ouachita mountain ranges in northern and western Arkansas are known as the Highlands; the southern and eastern parts of Arkansas are called the Lowlands. The so called Lowlands are better known as the Delta and the Grand Prairie. The land along the Mississippi river is referred to as the "Delta" of Arkansas. It gets this name from the formation of its rich alluvial soils formed from the flooding of the mighty Mississippi. The Grand Prairie is slightly away from the Mississippi river in the southeast portion of the state and consists of a more undulating landscape. Both are fertile agricultural areas and home to much of the crop agriculture in the state. The state's total gross state product for 1999 was $64 billion placing Arkansas 33rd in the nation. Its Per Capita Personal Income for 2000 was $22,257, 47th in the nation. The state's argiculture outputs are poultry and eggs, soybeans, sorghum, cattle, cotton, rice, hogs, and milk. Its industrial outputs are food processing, electric equipment, fabricated metal products, machinery, paper products, bromine, and vanadium. As of 2000, the state's population was 2,673,400.